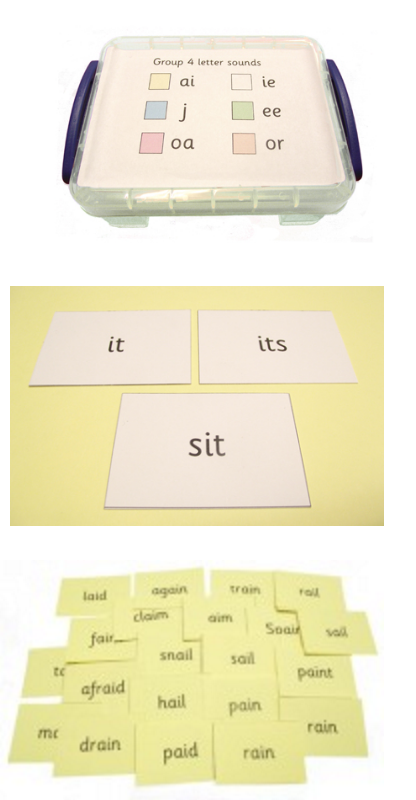 These Word Blending Boxes, developed by Jolly Author Sue Lloyd, are an invaluable resource for parents and teachers alike to help children practise blending with the letter sounds that they have learned. All you need to get started are 8 boxes (of any kind), coloured card, and labels (99.1mm x 67.7mm) or paper and glue. To get started creating your word boxes, you need to download the introduction, and the words for the word boxes (all of which are contained within one document). You then need to select the correct label file to download. You can choose to either download labels (3a or 3b) or “DIY” labels (3c or 3d) which you can stick on yourself. You also have a choice between pre-assigned colours, or blackline labels so that you can pick your own colours. Each of the 8 boxes contain one group of letter sounds (group 8 contains the alternative vowel sounds). The words are organised by colour, with each colour matching one letter sound from within the box. The group (and therefore box) that the words belong in are also indicated in the headings. The words are therefore easily identifyable within the box, giving you practise blending words for each letter sound using only those letter sounds which have already been taught. There are no words for the letter sounds /s/ and /a/ as they do not make any phonically regular words. The first words start with /t/ in pink, giving the words “at” and “sat”, as these are the only words which can be made with the letters /s/, /a/ and /t/. As more letter sounds are learned, more words can be made. You can now practise word blending easily, with a decodable word bank at your finger tips!